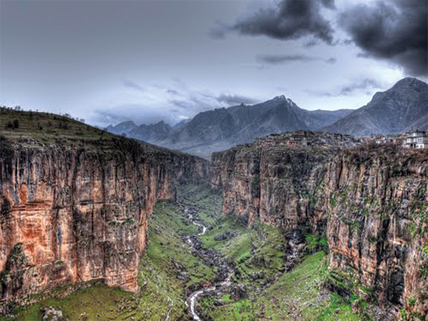 Rawanduz City The city of Rawanduz is located 107 km northeast of Erbil. The name of the city comes from Rawn, a famous poet from the area, and Duz, which means Citadel or Tower. It is located between the Valley of Karand and Kala Rash and is over 500 meters above sea level. The district is surrounded by mountains, Korek Mountain is to the south, Hindren Mountain to the north, Zozik Mountain to the west, and Bradasot Mountain to the east. Bekhal waterfall Bekhal waterfall spreads horizontally as it descends while remaining in contact with bedrock; the large stream issues from the mountain. Near the base of the mountain visitors can find a bazaar and food stalls. You can also climb up the fairly precarious and slippery steps to the top of the waterfall to experience the stunning view and drink the refreshing and sweet mineral water. Bekhal’s sweet water is used to bottle mineral water throughout Kurdistan and Iraq; the water is sold under the brand name of Kani Mineral Water.